We may issue you with clothing or uniform for some jobs. Please let us know your measurements so we can give you the right sizes. Please supply us with 3 good photos of yourself. We are after 1 head shot and 1 full length photograph. Choose the best photos you have and make sure it is only you in them. 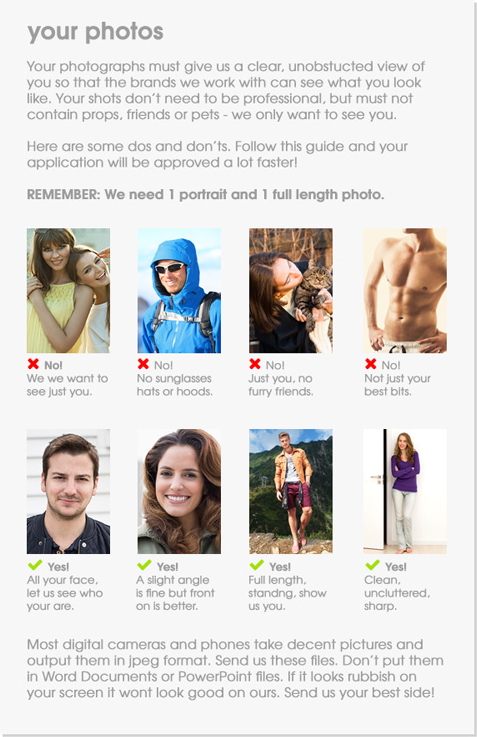 To avoid problems with your application approval, view our how to supply photos guide. Please select the areas you are willing and able to work in from the list below. Check all that are applicable. Please enter as much information as possible. Applications with more experience information are more likely to be approved. Describe the role and duties. What qualities do you feel you could bring to the Purity Staffing team? Write a sentence to describe yourself. Do you have a valid DBS check? I want to receive emails about new jobs and campaigns. I know I can unsubscribe at any time. Receiving job alerts is the best way to find out about new jobs and campaigns. If you don't tick this box, you will need to log in to the Purity Staffing portal and search for available jobs. I consent to the Company holding and processing data relating to Temporary Worker for legal, personnel, administrative and management purposes and in particular to the processing of any "sensitive personal data" as defined in the Data Protection Act 1998 relating to Temporary Worker including, as appropriate. I have read and understood the terms of engagement, which would apply if I was accepted on to the Purity Staffing team for Purity Productions. +44 (0)1296 682 555 for assistance.